Daniella Moffson, a pre-med student at Barnard College, was one of three people killed in a bus crash in Honduras while on a student volunteering trip. 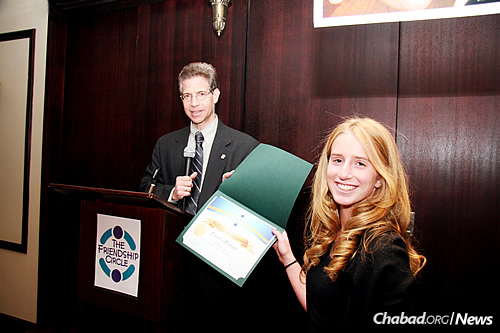 Several years ago, she received an award from Friendship Circle, presented by Manhattan Assistant District Attorney Gary Galperin. Daniella Moffson spent her winter vacation from college like she spent much of her time: by reaching out and helping others. In fact, she was doing just that in Honduras, volunteering with other students from Columbia University, when the bus they were in veered off the road and crashed on Wednesday. A former volunteer at the Chabad-Lubavitch-affiliated Friendship Circle, the 21-year-old Moffson was among three people killed in the accident. Olivia Erhardt, a 20-year-old student at Columbia University, and Abigail Flanagan, a nurse practitioner at Columbia University Medical Center, were also killed in the crash. The students were in Honduras as part of the Columbia chapter of Global Brigades, which provides health and economic assistance to under-resourced communities with the help of university volunteers. When news of the accident broke, Rabbi Shalom Pelman, director of Chabad Lubavitch Guatemala, didn’t stop to think. Instead, he grabbed his tallit, his tefillin and his passport, and went to the airport to catch the hour-and-a-half flight from Guatemala City to Honduras to assist the survivors and show respect for those who had passed away. In pre-med at Barnard College, Moffson was known for her cheerful personality and a willingness to help anyone in need. 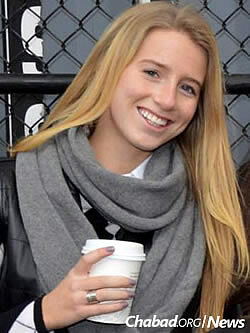 In 2011, she was among a group of teen volunteers honored by Friendship Circle on Manhattan’s Upper East Side for her involvement with the organization. Friendship Circle is an international program that pairs teen volunteers and children with special needs for activities and friendship. She also volunteered her time at Camp Simcha and with Chai Lifeline, programs that benefit children dealing with illness. Rabbi Sholom Duchman, director of Colel Chabad, is a longtime friend of Daniella Moffson’s parents, Michael and Sheera Moffson. He said the community is deeply saddened by the news. The letter offered a number of ways to help the families as they deal with their devastating loss. Among the suggestions were for people to attend a prayer or memorial service for the victims, as well as follow in their footsteps by performing acts of goodness and kindness.